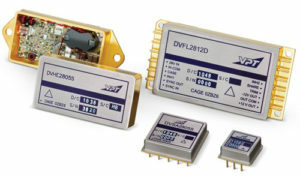 Avionics & Military DC-DC Converters | VPT, Inc. Ideal for commercial and military aircraft, weapons systems and more, this line of DC-DC power converters is ready to fly when you are. Save board space, weight, heat, and cost when you create an efficient power system using our isolated DC-DC converters plus our family of non-isolated, synchronous, buck regulated point of load DC-DC converters. With high efficiencies, wide temperature ranges, and DLA SMDs for most models, VPT’s wide range of offerings will match your program specifications. Isolated, thick-film hybrid converters for flight critical applications with extreme temperature requirements. -55 °C to +125 °C. Combine one isolated DC-DC converter with any of these point of load converters for reduced size, weight, heat and cost in your system. -55 °C to +125 °C , 5Vin nominal. These converters include EMI filtering plus power conversion in one small, light weight, cost-effective package.